In recent times we have seen Facebook make substantial efforts to expand their portfolio beyond basic social networking, delving into the fast-rising medium of video in a bid to rival the streaming giants like YouTube. This week however their announcement focused not on video but instead on music; which comes as no real surprise given how the two often go hand-in-hand. There was little detail given as to what form many of these new features may take, other than testing new ways of adding music to videos and other posts. In fact the only specifics given relate to the Lip Sync Live feature, which does exactly what you would expect from the name. “We’re starting to roll out Lip Sync Live, which lets you lip sync to songs from forever favorites like “Welcome to The Jungle” by Guns N’ Roses to new hits like “Havana” by Camila Cabello,” read the announcement, “With Lip Sync Live, you can express yourself with music from a variety of genres in real time. So whether you prefer songs like “Happier” by Ed Sheeran or “God’s Plan” by Drake, Lip Sync Live lets you bring friends and family into spontaneous musical moments. 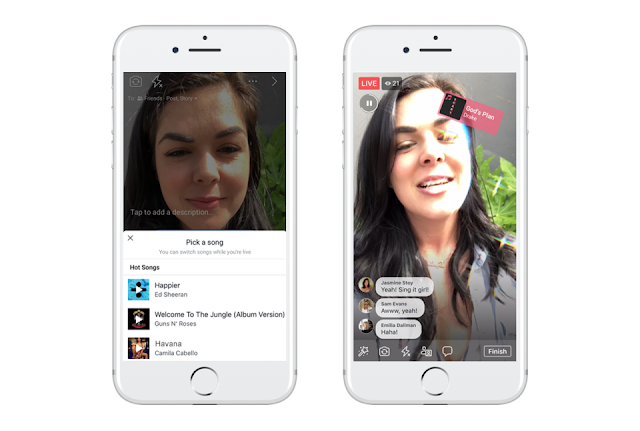 When broadcasting with Lip Sync Live, friends will see the artist and song highlighted on the video and can tap to easily follow the artist on Facebook.